There's nothing but smooth sailing ahead when you choose these stylish sailboat design wedding favours for your beach themed event. Sailing along with plans for a beach side wedding, or any beach themed event? Well, we've got just the favour to add to your beachy day! This elegant and fun glass sailboat design candle holder is sure to please. 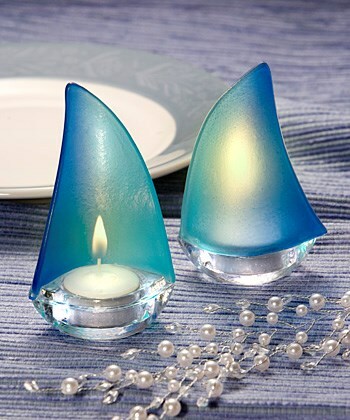 Each 3" x 5" favour features a heavy glass form with a sea blue sail rising up from a clear base that nestles a tea light candle. The candle is positioned behind the blue sail to allow for the ultimate glow from the flame. Each comes individually packaged in a white box with a tea light candle included.